I must admint,the past week was not easy. 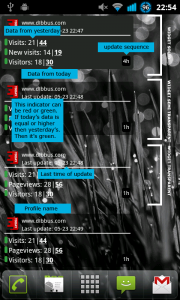 I’ve created Analytix for Google Analytix on the Android platform and the response is great! Of course I receive lots of requests from users. I started with lots positive energy and had a widget up and running in a few hours. But then,the problems arise. I had a very precise idea what I would like to see as the perfect widget. Profile picker, style picker, refresh picker and a metric picker. I think I’ve created over 10 widgets doing all just a small part of the perfect widget. I just didn’t succeed in combining all these pieces of code. One moment I thought I had a breakthrough, having created a perfect widget which was updating every 5 seconds(for testing only). But after I removed the widget, the update was still going on. I forgot to remove the contract with the alarm manager. Another issue was to get unique references to the widgets, so all widgets are processed in his own unique thread. Phew, 3 weeks(just working in the nightly hours) of testing and coding. Finally I could release the perfect widget for my app. If you’re interested in this app, search the market for Analytix. I’ve tried to create widget on a 2*1 tile but it was impossible to make it work with some sites having large numbers. The widget is covering 3*1 tiles. On top you’ll see the profile name and the date/time from the last update. This is dependent of the preferred refresh rate. Then you’ll see three data options with a colored dot in front. Here you can see the selected metric. After the metric you’ll see two numbers. The first is the metric from yesterday, the second is from today so you can easily compare if your site is doing fine. On each update the latest data is received from Google Analytics and compared to the data from yesterday. If it’s equal or higher, the colored dot will turn green. (Bouncerate will turn green if it’slower ofcourse ;-)). Bottom right corner shows the update sequence you’ve selected. 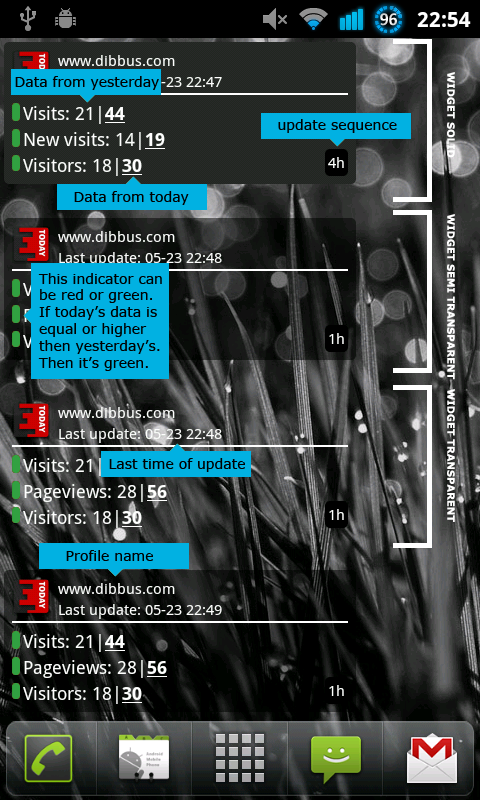 You can use several midgets on you homescreen, so you can monitor many sites in a glimpse!!! Apple look on Android, the horror!